Acrylic nails are attached to the natural nail with extremely strong glue. This glue cannot be dissolved with soap and water. Instead, you’ll need to use acetone to soften it to a point where you can pull the nails off. In some cases, the nail will also dissolve in the acetone bath. Don’t ever try to pull the nails off without softening the adhesive or you risk damaging your natural nail. Hot water will help speed up the process. Lay an old towel over the workspace. Acetone can dissolve varnish and paint and can ruin furniture and floors. Fill a small bowl with acetone. The bowl should be large enough for your fingers to fit in it. Fill a large shallow bowl with 1 inch of hot water. Place the small bowl inside the large bowl. This will heat the acetone slightly, which will speed up the removal process. 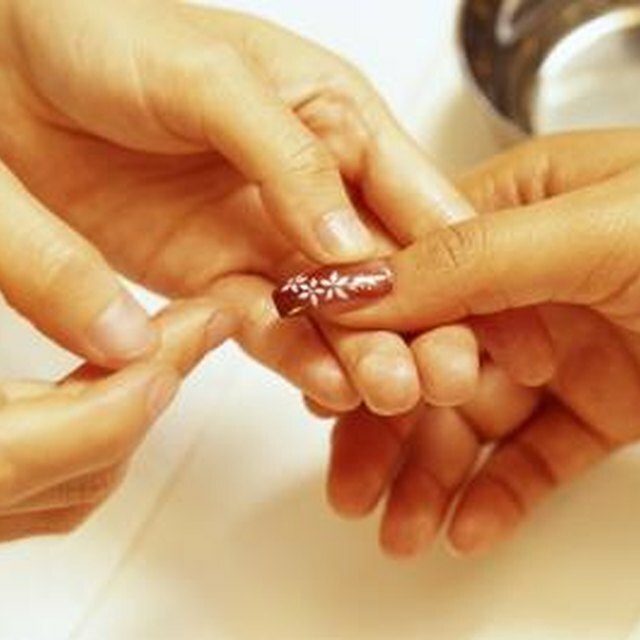 Cover the skin around your nails and your cuticles with petroleum jelly. This will protect your hands from drying out with acetone. Wipe any petroleum jelly from your nails. Soak one hand in the acetone for 30 minutes. This will dissolve the acrylic nail and the adhesive. Remove the hand from the acetone every 10 minutes and scrape the acrylic nail and adhesive residue off. Do this until all of the nails are completely clean. Brush the nails on that hand with a nail brush to remove any small pieces of acrylic. Repeat the process with the other nails. Wash your hands with soap and water and moisturize them completely to prevent them from drying out. Avoid heating the acetone by placing it in the microwave or on the stove. Acetone is highly flammable so always keep it away from open flames or excessive heat.